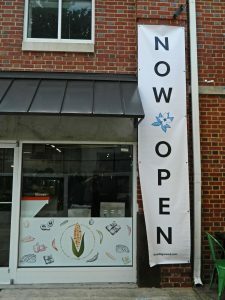 Blue Dogwood Public Market, located at 306 W. Franklin Street in Chapel Hill, is the first food hall to open in the Triangle — but it will soon be followed by three more: Transfer Co. Food Hall (Raleigh), the Durham Food Hall and Morgan Street Food (Raleigh). 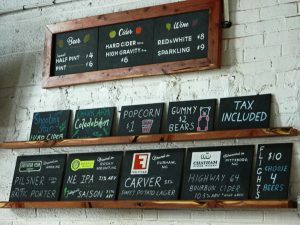 After a soft opening trial run and a grand opening last weekend, Blue Dogwood has officially opened its doors to the public. 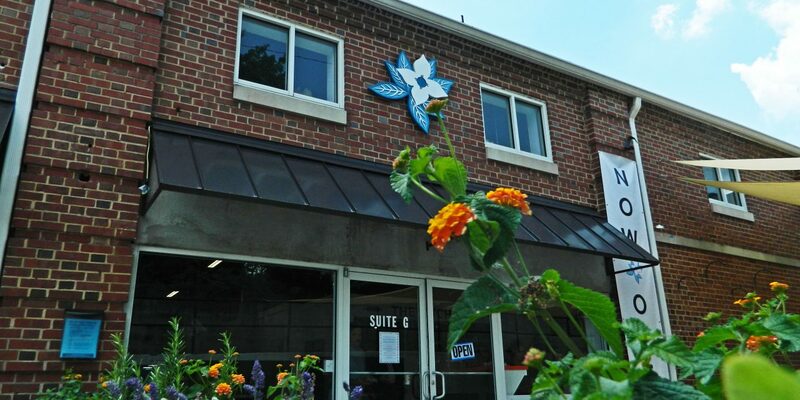 Running Wednesday-Saturday from 11 a.m. to 8 p.m. with Sunday hours from 10 a.m. to 3 p.m., Blue Dogwood boasts seven locally based current vendors under one roof — and has space for several more. Like food trucks and farmers markets before it, the modern food hall — traced to Turin, Italy, and the Eataly concept founded by businessman Oscar Farinetti — is a result of bare-bones practicality shifted significantly upscale. The idea isn’t new: a collection of small-scale restaurants and food vendors collected in a single open space. Both are strictly counter-service and share a strong emphasis on food – and the acquisition of it – over ambiance. But this variation of it has taken off in all the major markets it needed to in order to be taken seriously as both an idea and an investment. From New York to Los Angeles, Austin to Atlanta, the food hall’s rise has been spectacular. Food halls are direct descendants from the public markets of the pre-supermarket era and the food stalls that often stood side-by-side local goods. Blue Dogwood in Chapel Hill takes cues from raw, industrial interior design inside its 4,002 square feet of space. Exposed ductwork and a large shared-space kitchen give the interior a working-environment feel, and the local no-nonsense feel somehow comes off as friendly and welcoming. In Blue Dogwood, seating areas are shared between vendors, meaning that there’s no exclusivity when it comes to finding a spot to enjoy your spoils and that individual businesses are free to concentrate more on their own offerings. Consolidating several vendors under one roof is a win-win: higher foot traffic means more potential customers and crossover, and multiple vendors increases the chance of customers finding something they’ll thoroughly enjoy. Among the counters under Blue Dogwood’s roof are some familiar names, along with some that might not be as well known. Chocolatay Confections is represented, a significant development for husband-and-wife duo Matthew and Danielle White after finding success in several local farmers markets. Saxapahaw-based butcher shop Left Bank Butchery is on hand with charcuterie and fresh cuts of meat, alongside Soul Cocina, a vegetarian local Latin staple. The diversity of offerings at Blue Dogwood doesn’t end there, either. Pizzelle Bakery offers gluten and soy-free baked goods in coffee-shop style, the Vegan Flava Café serves up an entirely plant-based menu that varies almost by the day and Manuchehr Haghshenas’ Rumi Persian Café slings lamb shank and Persian stew in authentic style while the Blue Dogwood Bar has beers on tap from local breweries that don’t yet have big-ticket distribution deals. Blue Dogwood leans hard into local food culture and is better for it. 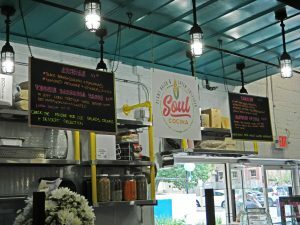 A shared space drives down individual rent prices for vendors, and the no-frills environment allows for full concentration on food from both sides of the counter. No matter what you’re looking for, Blue Dogwood is likely to provide a taste of home.